Blackidea has found a video from NokiaFrance demoing the new Symbian Anna AKA PR2.0 on the Nokia E7. I don’t really speak enough French to understand anything of importance that’s been mentioned. At a quick glance it looks like they’ve implemented maemo style blurring of background to focus foreground items (e.g. email) but no, that’s just for privacy reasons. Symbian^3 already has something like this anyway though instead of blur you get a translucent black layer in the background. You can see again, the improved calendar appearance, with full screen calendar (no ugly sidebar. I’ve hated that since S60 5th). Contacts seem to have been slightly more streamlined. Long press to send message/call/email – before you could send message, delete contact, send business cards, add favourites. Now long press has functions you’ll probably use more often. « Futuristic Nokia caught in Real Steel movie trailer. 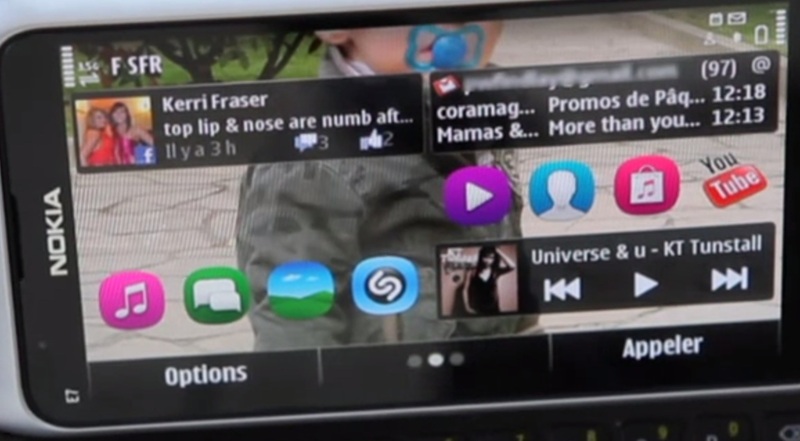 Has MeeGo like screen – Nokia N9?